A package containing three new softcover titles from Woodland Press LLC, Chapmanville, WV, arrived in my Monday, Oct. 24 mail. What follows is a teaser description of the books; full reviews will be forthcoming. I look forward to reading and reviewing anything from Keith Davis and his West Virginia publishing treasure Woodland Press. 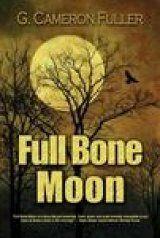 "Full Bone Moon" by G. Cameron Fuller (276 pages, $25.99) is a fictionalized account of the murders of two students in Morgantown, WV in 1970. Someone is killing West Virginia University students. Again. Six years ago, two WVU freshmen were last seen hitchhiking back to their dorms after seeing a movie in downtown Morgantown. Their bodies were later found in the dark woods south of town. E.P. Clawson was convicted of the murders, but Michael Chase, a reporter for the Herald-Dispatch, never thought Clawson was guilty—a belief that nearly cost him his career. Now the murders have started again. Female WVU students are disappearing, and their defiled bodies are found with ritual markings. Full Bone Moon, a first place winner, novel, in the annual West Virginia Writers contest, follows Michael Chase as he tracks the ritual killers through the streets, underground tunnels, and forests of Morgantown. Inspired by the actual murders of Mared Malarik and Karen Ferrell in Morgantown in 1970, "Full Bone Moon" employs the many rumors and speculation that swirled around the Morgantown area after the killings, and continue to this day. Rumors of cult activity, high society complicity, police corruption and coverup, and FBI treachery are woven together in Full Bone Moon to take you on a wild ride — a fast-paced fictional thriller — through the Coed Murders as they could have happened. 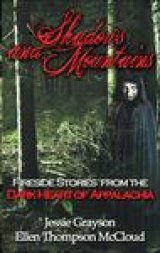 "Shadows and Mountains: Fireside Stories From the Dark Heart of Appalachia" by Jessie Grayson and Ellen Thompson McCloud (140 pages, $13.95). Glimpse beyond the stunning beauty of Appalachia into what hides beneath. Allow these stories to guide you down spooky hollow roads and deep into the mysterious mountains within its dark heart, where monsters, mayhem and madness abound and things are never exactly as they seem. Walk the hill paths, under the light of a sinister moon, with authors Ellen Thompson McCloud and Jessie Grayson as they weave together several chilling tales that promise to leave you staring into the wilderness, wondering what might be staring back. Fireside Tales from the Dark Heart of Appalachia dares the reader to look beyond the obvious splendor .... Will you? 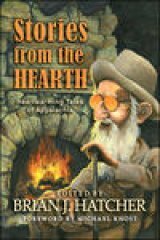 "Stories from the Hearth: Heartwarming Tales of Appalachia" (128 pages, $15.95) Edited by Brian J. Hatcher. Stories By Beth Cato, Diane Tarantini, Shelly Li, Karin Fuller, Rachel Towns, Jamie Lackey, Lee Ann Sontheimer Murphy, Josh Reynolds, Theodore Carter, Jeff Baker, Steve Rasnic Tem , and Sara J. Larson. New stories with deep roots. Experience the power of Appalachian storytelling as twelve exceptional authors from around the world give their unique interpretations on a truly unique art form. Local, national, and international voices honor a grand tradition by telling stories as fresh as a mountain stream and as old as the hills. Powerful tales to edify the mind, move the heart, and stir the soul. The fire is lit. Gather ‘round. It’s story time. Look for my upcoming reviews in the days and weeks ahead. The "teaser" descriptions of the three books are from the Woodland Press website: www.woodlandpress.com.